The Clean backup window can be opened from the Jobs->Clean menu item. 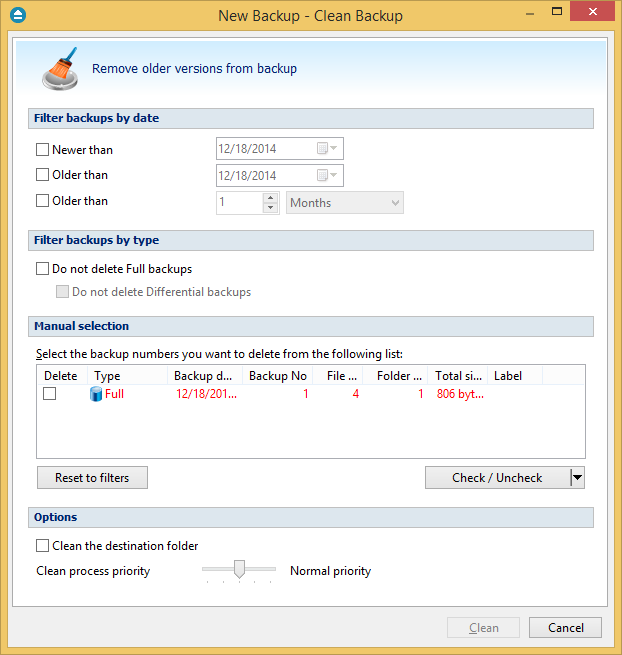 It gives options to delete backup numbers based on certain criteria. When you open the window all the backup numbers are displayed. 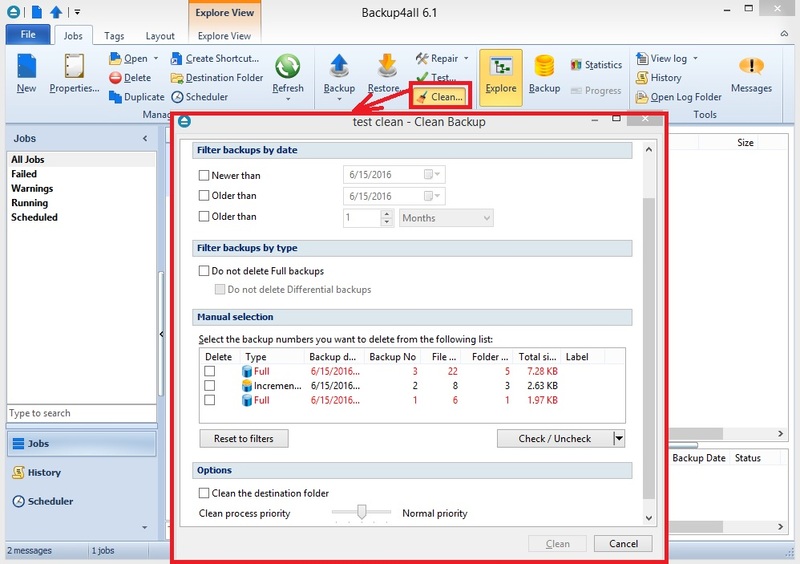 You can either manually check multiple backup numbers you want deleted or use the filter options to have them automatically selected if they match a certain criteria. Once you select a type of backup, if there are other backup numbers depending on it they will automatically be selected too. 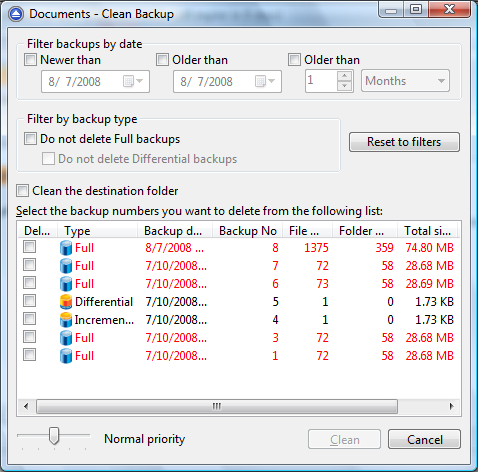 For instance, selecting a Full Backup (marked with red in the list) will also batch select the other incremental or differential backup numbers that depend on the selected full backup (to keep some of the backup numbers that depend on the full backup, you will have to start un-selecting them in the order they were created). Please note: when you delete a certain backup number using the Clean Backup tool, all the files that were created for that backup number in destination, will be removed. Delete - Shows if a backup number is selected for deletion. You can manually check/uncheck the backup numbers you want deleted. Once selecting a backup number all the other backup numbers that depend on it will also be selected. Type - Type of the backup. Each of the backup types is represented by a descriptive icon and text: Full, Incremental, Differential and Mirror. Additionally, full backups are marked with red. Label - Label of the backup increment. The backup numbers in the list can be sorted by clicking on the column headers. The right-click menu on the column header provides a handy way to show/hide unnecessary columns. You can select a backup number by right-clicking it and choosing Check Selected (or uncheck it using Uncheck Selected). The right-click menu also allows selecting all backup numbers (Check all) or unselecting them (Uncheck all). Using the Priority slider you can set the execution speed compared to the rest of the running processes on your computer. Default is Normal priority, but there are other 4 priority levels: Lowest priority, Low priority, High priority and Highest priority. On Lowest priority the process will consume the minimum amount of computer resources but will take the longer to complete, while Highest priority will consume the highest amount of computer resources but will take the least to complete. Newer than - If checked backup numbers that are newer than the selected date will be removed when the Clean operation is executed. Older than - If checked backup numbers that are older than the selected date will be removed when the Clean operation is executed. Older than (fixed date) - The backup numbers that are Older than a certain fixed date will be deleted when the Clean operation is executed. Do not delete full backups - If this is checked, the full backups will be kept even if they fall into the range of files filtered for deletion. Do not delete differential backups - If this is checked, the differential backups will be kept even if they fall into the range of files filtered for deletion. Note that this option is available only when Do not delete full backups is checked, because differential backups depend on full backups. Reset to filters - Pressing this will ignore any manual selection done and restore the default selection based on the filters applied. Clean the destination folder - Deletes any files and folders inside the destination folder even if they are not related to the backup job. Since version 5 of Backup4all, all actions are executed in command line. The interface is also available and you can see the progress in interface. The difference is that now there is a easier process with a single application, no need to set up a different command line application. In Backup4all you can clear the backup job, which means to delete all backup versions from destination and also delete the backup catalog. That will result in a fresh job, starting that backup from the beginning.